In every web and software project it’s important to find a good balance between different interests in order to produce a successful product or service. My biggest takeaway from reading A Project Guide to UX Design was the idea of maintaining a good tension between different interests in a project group. In this article I will describe what those interests are and what will happen when any of them becomes too dominant. I will also share my thoughts on how to overcome imbalances. The business goals of the product. For example to sell more products, to reduce the number of support calls or to strengthen brand awareness. The interests that the developers that actually builds the application have. Examples of these might be fast development, code reuse and maintainable code. The needs of the end users. It might be a problem they want to solve or the need for an easy way to perform at certain task. The image below illustrates a project with a balanced tension between the different needs. This is the ideal state in a project. Often it’s impossible to maintain a perfect balance but It’s important to always strive for it, at least if you want a successful project. Although the business goals are really important, since they are the very reason that the application exists, it must not be a too dominant interest. When that happens the result is a product that fulfills business goals but are expensive, buggy and fails to meet user needs. Failing to meet user needs often lead to that the business goals are ultimately not met. A product that’s unusable or doesn’t make it worthwhile to use will probably be abandoned sooner a later. An example of this could be that a business goal is to collect as much user data as possible with an extensive sign-up form to get good sale leads. The user on the other hand wants to try out the application before making a big commitment. The huge form seems daunting and the user is reluctant to give away personal information this early in the process. This leads to fewer users actually signing up, and business goals are not met. If developer needs dominates the end result is a cheap solution of high quality that fails too meet business goals or to address user needs. Having the perfect application with brilliant algorithms and perfectly tuned databases is never a mean to an end. It doesn’t matter how awesome your solution is if it fails to meet business goals. This means that the application probably can no longer exist, since its ultimate success depends on business goals being fulfilled. 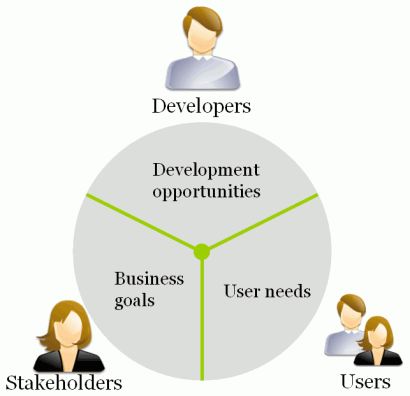 While it’s important to focus on user needs the project must never lose sight of business goals and developer needs. What happens is that you end up with a solution that indeed fulfill user needs but is expensive, buggy and fails to meet business goals. This is, in my experience, rarely a problem. More often I think the problem is that user needs are totally neglected. 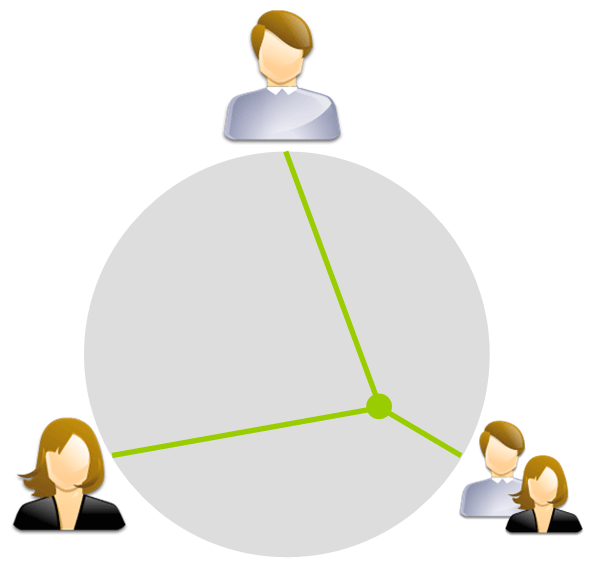 Fulfilling user needs often goes hand in hand with meeting business goals. But there are of course often compromises that needs to be made between the two. So also with developer needs. Some functions that would have been perfect for the user might be to complicated or expensive to develop to be a viable solution. I personally think that good communication within a project, combined with an awareness of the different needs, is key for a successful project. The biggest mistake to make is to isolate developers and designers from the stake holders. There’s everything to win in keeping them involved in this process so they also have an awareness of business goals and how the customer thinks. This goes both ways. Having a dialog between stakeholders, developers and designer leads to better understanding of all the different needs. My experience is that it also leads to stronger commitment within the team and that it can lead to new great ideas that neither party would have come up with in isolation. Finally I think it’s important to have a dedicated member of the team that has the users interests in mind. Be it a UX-designer, and interaction designer or one of the developers. Far to often this is the one interest that is forgotten altogether. One way to raise the awareness of user needs is to conduct usability tests with the whole project team as observers. That’s usually a real eye opener. How does your projects work? Are they dominated by any particular interest or is one interest totally forgotten? How do you keep the interests balanced? If you want to read more about the tension between different interest in a project and techniques to find a good balance, I suggest you check out the excellent book A Project Guide to UX Design. Pay special attention to Chapter 9 – Transition: From Defining to Designing, where this process is described in detail. You can also check out my full review of the book.